Moz has released the results of their yearly Local Search Ranking Factors survey, and the results are consistent: the lines between organic, local, social and mobile are blurring, and optimizing all three is essential in ranking you for local SERPs. The overall results showed that place page signals and on-page signals top the list of factors that help you rank on the SERPs. Place page signals make up amount to almost one-fifth of your local SEO effort (19.6%), while on-page signals come in second at 18.8%. The results varied for different local results, but the top two signals overall dominated each listing type. For localized organic results, on-page signals proved to be the most important ranking factor. For pack/carousel results and maps results, place signals dominated the ranking factors. It is noticeable in all three listing types that traditional SEO factors like link signals, personalization and behavioral signals do not affect local search as much as the rest of the factors. The Competitive Difference Makers list brings out one big surprise: the quantity of reviews from authority reviewers (for example, Yelp or Multiple Places Reviewers). The rest of the results were consistent with the primary ranking factors, but shifting focus from quantity to quality. Another surprising factor is the appearance of domain authority on both primary and competitive difference lists. As an organic SEO ranking factor, it plays an important role in demonstrating site authority, but as a local SEO ranking factor, it has been more problematic over the years. It’s interesting to note how Google will address name changes, especially when business revamp themselves – will these retain domain authority, and how will it reflect on search? It’s important to note the large role that social, specifically Google+ and Google+ Local, plays as a competitive difference maker – there are more than ten factors involving Google+ and Google+ Local out of ninety-seven that were ranked as competitive difference makers. 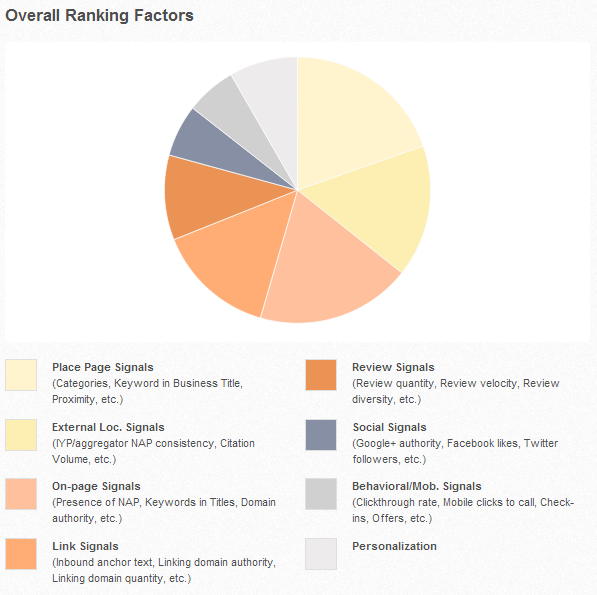 This is despite the fact that social signals only received an overall rating of 6.3% for ranking sites on local search. Social may not have as much of an influence, but it’s a game-changer nonetheless. Don’t let the 6.3% ranking influence rate fool you – with more than ten out of ninety-seven game-changing ranking factors being related to Google+ and Google+ Local, it’s important for you to pay attention to social. Make sure you claim and optimize your business page according to the guidelines set in this survey. Pay attention to your Place Page signals, Maps listings, and reviews. Combined, these signals make up almost half of your local search efforts already. Update your information and make sure it is consistent throughout all your existing listings, and that it is consistent with your website information. On-page signals and link signals make up for Place page signals for localized organic results. The survey shows that businesses without physical addresses can still rank for local search if they focus on on-page and link signals that help them rank for localized organic results. Include crawlable NAP information in the HTML, optimize titles with place keywords, and build inbound links from local influencers to rank for localized organic results. Talk to your account manager to help you understand these survey results more, and to guide you through our local search solutions in our private label reseller program. We’d be happy to talk you through our methodology. Sign up today if you’re not yet our partner to get started. Keep checking back for more updates and tips on the SEO and online marketing industry!